We strive to achieve prosperity and customer satisfaction through continual improvement in product quality, competitive pricing and timely delivery. Today’s test is tomorrow’s testimony. 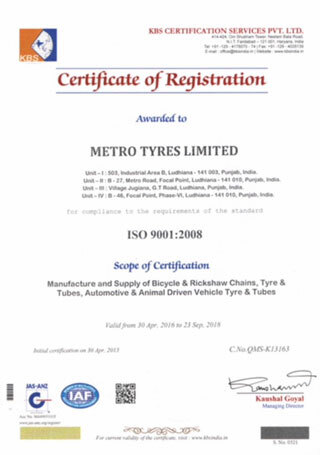 Metro Tyres’ exceptional growth record reflects in the many certifications and awards the company and its parent corporate group has received in its long innings of quality manufacturing. 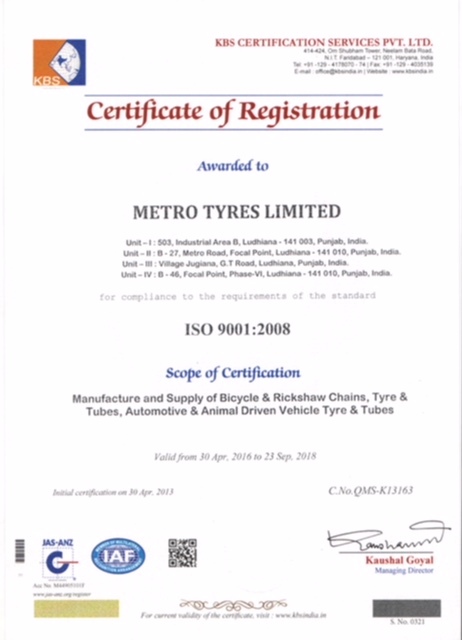 Metro stands for a complete convergence of technology, systems and human resources. Modern plants, best-in-class equipment and a workforce driven by the mantra - Strict discipline and Positive attitude – are the pivots of lasting quality in all our operations, services and products. 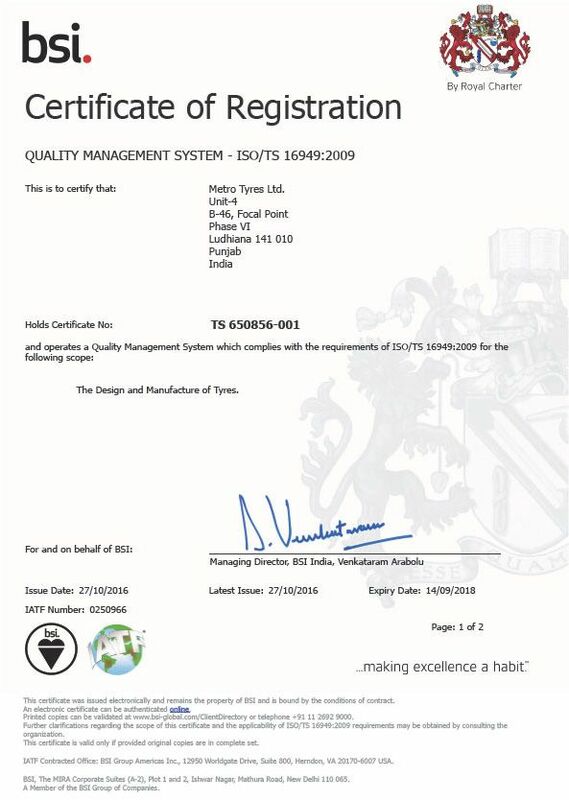 Attaining quality standards is an everyday practice at all our facilities – be it manufacturing or distribution. Strict adherence to quality standards begins at shop floor itself. Every worker ensures that he receives right quality and delivers right quality through the product cycle. 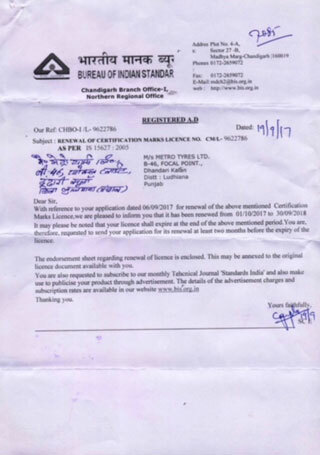 As each component undergoes various tests and checks at all stages of the manufacturing process, total quality is ensured from raw material procurement to its processing till the delivery of final finished product. Constant technology upgradation ensures that the group companies stay competitive in the global mainstream in terms of price and quality expectations of the end consumers. 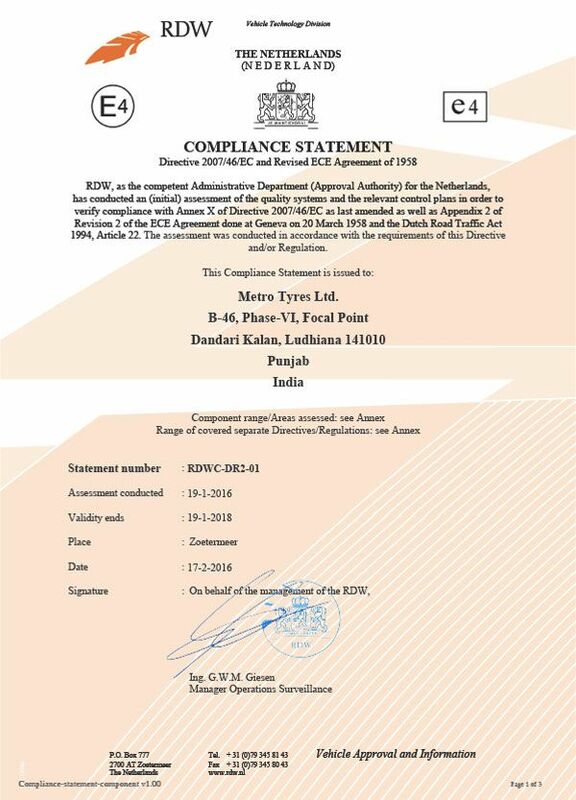 Services of the advanced test laboratories of our Technical Collaborator, Continental AG are taken to strengthen the quality requirements, develop new designs and improvise the existing production processes. 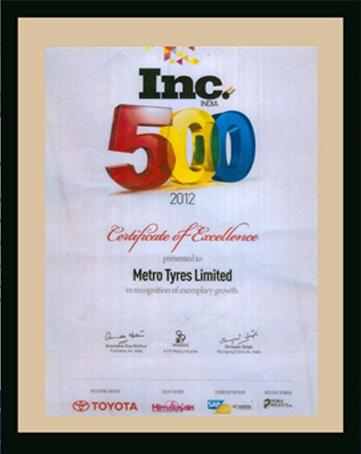 We strive to achieve customer satisfaction through continual improvement in product quality, competitive pricing and timely delivery. To produce quality products, we carry out unique product tests, both indoor and outdoor through very sophisticated equipments. 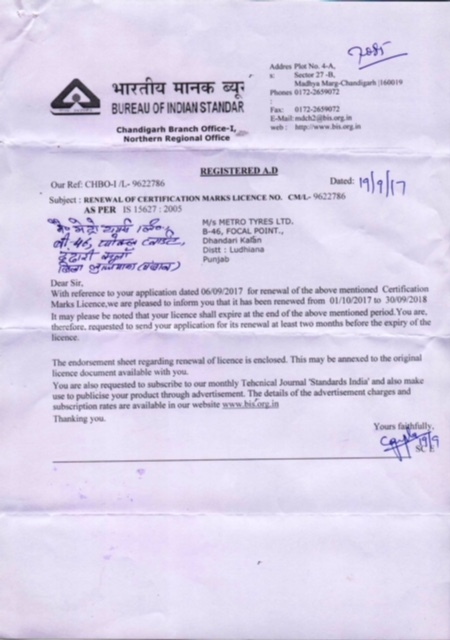 The certifications and awards we have received at various steps of our journey are powerful motivators in our uncompromising quest for excellence. 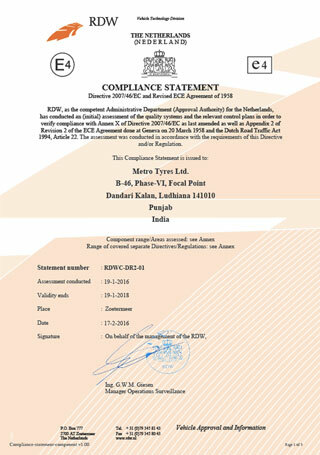 The Metro Group proudly conforms to TS-16949:2009 standards in all its units and meets the Indian and international standards for our various products, viz., ISI, ASTM, T&RA, JATMA and ETRTO. 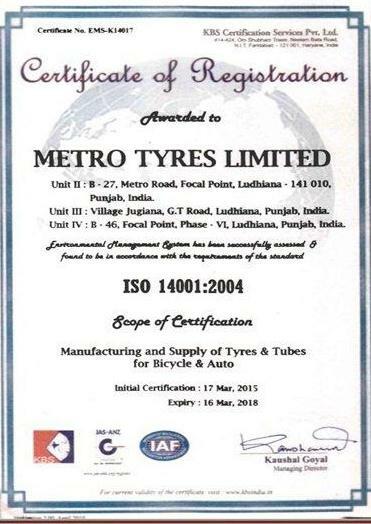 All our seven manufacturing plants are ISO 14001:2004 certified. 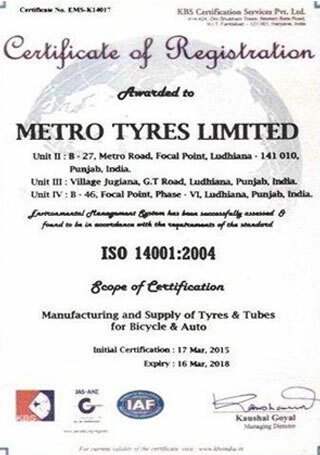 For over 15 years, the Export Promotion Council (Capexil), sponsored by Ministry of Commerce & Industry, Government of India has continuously awarded Certificates of merit / award for outstanding export performance in respect of tyres and tubes to Metro Tyres. 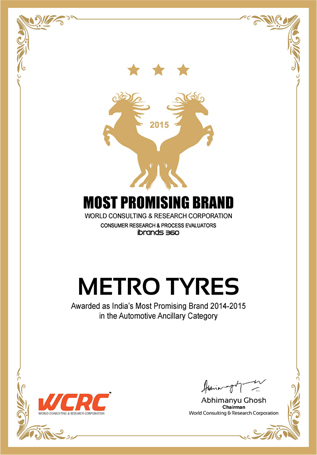 Metro has also been adjudged “Indian's Most Promising Brand for 2014-15” by World Consulting & Research Corporation (WCRC), a multi-dimensional consulting company with belief in its core values of innovation and intelligence which, in turn, create brand value.